If you own a house, you own a water heater. You probably don't spend much time thinking abou­t the water heater until, one morning, you go to take a shower and there's no hot water. Then you probably think about it a lot. And if you're the curious sort, the following water-heater question may have crossed your mind: "How can the water stay hot if cold water comes in as soon as you start using the hot water?" Typically, this tank holds 40 to 60 gallons. It has to be able to hold the pressure of a residential water system, which typically runs at 50 to 100 pounds per square inch (psi). The tank is tested to handle 300 psi. The steel tank normally has a bonded glass liner to keep rust out of the water. The thermostat controls the temperature of the water inside the tank. Normally you can set the temperature between 120 and 180 degrees Fahrenheit (49 to 82 degrees Celsius). It is generally recommended that you keep the temperature between 120 to 140 degrees F (49 to 60 C) -- especially if there are children living in the house -- to prevent scalding. It also saves energy. Normally, the thermostat is underneath a cover plate and it has a knob or a screw that you can use to set the temperature. 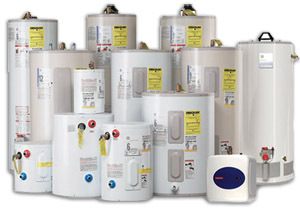 Water Heaters Express can help you with any of your water heater needs! Give us a call today!